At a time of high stress in US-China relations, underscored by repeated tariff salvos and heightened trade war rhetoric, objective data on the two-way commerce dynamic knitting together the world’s largest economies is more valuable than ever. Our China Investment Monitor, launched in 2011, shows Chinese direct investment in the US by year, industry, sector, deal type, and government ownership. The tool is a testament to Rhodium’s ability to produce data-driven observations on complex global trends. Updated quarterly and made available to the public in aggregate form, the interactive map is the go-to source for journalists reporting on financial flows from China in today’s emotionally-charged political environment. Our reliable, real-time data, covering the period from 2000 to the present, shows important recent deviations from past trends. Tracking such variance and its likely indications for the future has become increasingly essential as new wrinkles emerge in this complex bilateral economic relationship. Both Washington and Beijing have set in motion policies over the past two years that have squeezed foreign direct investment flows into a diminished position. In the U.S., the Foreign Investment Risk Review Modernization Act has empowered the government to scrutinize and block even small minority foreign investments into technologies deemed sensitive. Meanwhile, the Chinese government cracked down with much more stringent capital controls on outbound investment. The goal of our database is to offer an objective perspective on Chinese direct investment in the US by providing an accurate assessment of trends to policy leaders, executives, and the general public in both China and the US, leading to better policymaking and understanding of opportunities and risks. 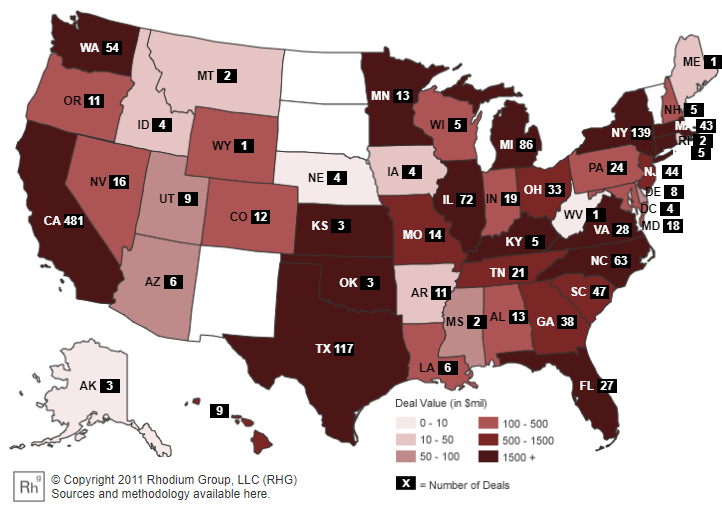 Rhodium, in partnership with the National Committee on US-China Relations, produces public reports and provides additional dimensions for exploring the data on the interactive US-China FDI Project website.